An original manuscript of “Take the A Train,” compositional sketches that were never completed and a revealing look at the royalty earnings of one of the 20th century’s most revered composers: These are a few of the 18,000 documents collected in Billy Strayhorn’s personal archive, which is now available to the public at the Library of Congress. The library announced its acquisition of the papers on Thursday. 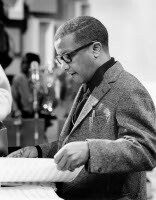 Researchers must go in person to access the collection, the Billy Strayhorn Musical Manuscripts and Estate Papers, which have not been digitized, but the library has created a digital finding aid. Many of the materials in the collection come from Strayhorn’s 25-year run as a member of Duke Ellington’s organization, where he was the bandleader’s closest collaborator and co-composer. 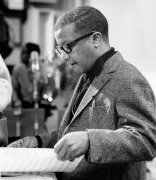 But it also includes materials from Strayhorn’s youth — including an original handwritten manuscript of “Fantastic Rhythm,” the full-length musical he wrote while still in high school, and of “Something to Live For,” a now-classic piece composed before his years with Ellington — and from side projects throughout his life.